Tectonic and Structural Framework of the Zagros Fold-thrust Belt, Volume Three presents the latest on one of the most-studied terrains in the world. This collection of new research and developments on its tectonic and structural geology is crucial and will have broad appeal, not only in Iran, but worldwide. Collisional mountain ranges, such as Zagros, the Himalayas, the Alps and the Andes share common fundamental deformation mechanisms, therefore geoscientists study these ranges and compare and contrast the research. The Zagros range is studied by geologists from different parts of the world, particularly with the goal to understand its unique dynamics and kinematics. In addition, the Zagros range is a potential source for hydrocarbons, thus it is of particular interest to petroleum geologists and exploration companies worldwide. The book is much needed for oil companies, especially the ones working in the Middle East. So it could be an excellent reference or a text book for their short course programs. 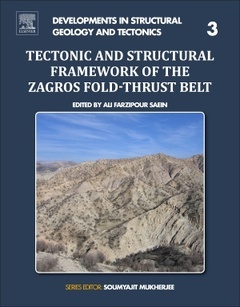 Because the Zagros is famous for its unique structures, it will be a very good reference for all structural geologists as well. This book could be used as one of the up-to-date reference books at universities in undergraduate and postgraduate levels.